Today is the 252nd anniversary of the birth of Robert Burns. People all over the world will be reciting his poetry, eating haggis, and all that. I’ll be eating chocolates–wee bonbons and truffles made with single malt whiskeys: Talisker, Lagavulin, Macallan, Glenfarclas and more. I’m lucky enough to be in this position because Kelley a) is talented enough to have written a brilliant novel, b) smart enough to have found a publisher who treats her well, c) generous enough to share the result. 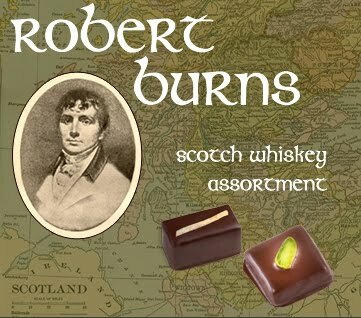 Which is just a complicated way of saying that the publisher of Solitaire, Small Beer Press, sent her a box of L.A. Burdick’s Robert Burns Scotch Whiskey Assortment–handmade chocolates–and Kelley has found the perfect way to get what she wants by doling out delicious dollops as incentives for good behaviour. Ah, but just to really torment you, here’s a description of the chocolate I’m about to eat right this minute: Glenfarcas–Dark chocolate bonbon made from Glenfarcas whiskey and figs. Mmmmmn. It's Australia Day here and as usual, we're a day ahead of you, we had Burns yesterday, though few would have been aware of it. I'm enjoying your chocolates by proxy with a café cognac! Thank you for sharing!